Golo Föllmer / Alexander Badenoch (eds. ): Transnationalizing Radio Research. New Approaches to an Old Medium. Bielefeld: Transcript 2018. 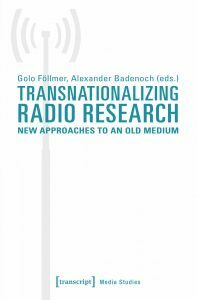 Transnationalizing Radio Research presents a theoretical and methodological guide for exploring radio’s multiple »global ages«, from its earliest years through its recent digital transformations. It offers radio scholars theoretical tools and concrete case studies for moving beyond national research frames. It gives radio practitioners inspiration for production and archiving, and offers scholars from many disciplines new ways to incorporate radio’s vital voices into work on transnational institutions, communities, histories and identities.